Using the Project Assistant, PTGui will automatically determine the best projection type for your panorama - rectlinear for small FOV's and cylindrical for larger FOV's. 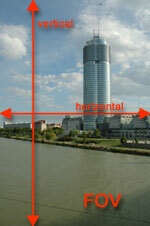 The FOV describes the angle between the outermost rims of your lens/panorama: 3 values are commonly used when talking about the FOV of a picture: The horizontal FOV, vertical FOV and for special cases (e.g. fullframe fisheyes) the diagonal FOV. If not explicitly mentioned we normally talk about the horizontal FOV. This is true for single images as well as panoramas. Rectlinear will project on a flat surface. This projection type is limited to a maximum FOV below 180 degrees. At a FOV of 180° or more, the outermost rays wouldn't meet the surface any more. Also, higher FOVs will make the image appear distorted on the edges as you can see in the example picture below. Rectlinear projection at a FOV of 160° Cylindrical will cast its rays on a cylinder from inside. This gives you a maximum horizontal FOV of 360 degrees (the full circle) but for the vertical FOV the same limits apply as for the rectlinear projection. For printing purposes, you will unwrap the hull of the cylinder on a flat surface. Edges will not look that distorted but lines that are not exactly vertical may look heavily distorted. Cylindrical projection Equirectangular is capable of displaying the full 360 degrees horizontal as well as the 180 degrees vertical. It is the unwrapped surface of a bubble and the distortions are the same as you will know from a world map. This projection type also will bend straight lines but it will look quite natural as long as you don't use the vertical FOV near the 180° limit. This projection is most commonly used for so called interactive/VR-panoramas. The values of projection and FOV of the panoramas can either be directly set in the "Panorama Editor" window or the "Panorama settings" tab on the main window. I suggest controlling and correcting these settings in the final step when you will render your panorama and want to crop unwanted image areas.